Wise-cracking vamp, Elvira, wants to put on a show in Las Vegas but she's short $50,000, so when she learns that her wealthy Aunt Morgana has just died, she rushes off to old-fashioned, conservative Falwell, Massachusetts, for the reading of the will. In typical Elvira fashion, she can't help but stir things up when she makes her appearance in Falwell. Elvira's dreams of stardom are put on hold when she accidentally winds up in a mysterious Carpathian castle inhabited by Lord Hellsubus. 26 horrifying films on 13 DVDs! Over 38 1/2 hours of frightful fun. 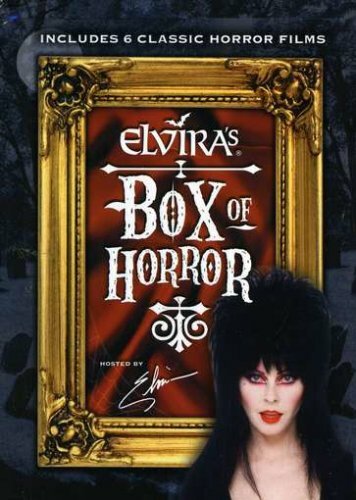 Elvira, the Mistress of the Dark, hosts this frightfully funny collection of B-Movie horror classics with her own unique style, all delivered in this collectible tin coffin.